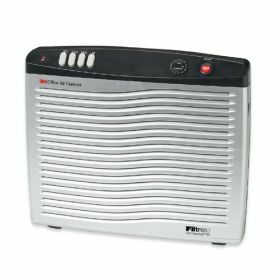 These compact-sized air cleaners help clean the air and reduce odors in your work area. performance; however, filter effectiveness lasts up to three months under normal conditions. - Room air and particles are drawn into the air cleaner. - Filtered air is released from the top of the unit, increasing air circulation in your office. - Filtrete® Air Cleaning Filter captures airborne particles and removes them from the air . - Three operating speeds (OAC50 has 2 fan speeds): Hi, Med, Low. - Built-in Activated Carbon Filter helps reduce odours. - Air Intake Grille releases easily for quick replacement filter changes. - Ionizer imparts charge to filtered air, enhancing cleaner efficiency. - Filter change calendar dial reminds you when it’s time to replace your filter.